In every florist's career there will come a time that writing about flower arranging will be necessary. Care instructions, workshop literature, website text, freelancing writing and book proposals are all types of writing about flower arranging that may come up. While it is possible to outsource this work to a ghostwriter, keeping it in-house and putting your own special touches to it will help separate your business from others. It will also allow you to handle any writing need that comes up, to save money, and maybe even lead to a flourishing side career of writing for others! Writing out care instructions is a unique way to show your customers how much they matter, and how dedicated you are to helping them make the most of the flowers they purchase from you. It's also a great way to keep yourself from having to repeat the same instructions over and over again. Think of writing care instructions as akin to writing a recipe. Be precise in the instructions ("Fill a vase with 1 litre of water" instead of "Put some water in a container") and offer explanations for why you are offering this advice ("Change water every other day to avoid bacterial or fungal build-up"). Use bullet points or a numbering system to keep instructions short, focused and easy to read. Print instructions onto pretty paper or notecards and don't hesitate to advertise yourself on the bottom or back of the page. If you decide to host night-courses, workshops or seminars then it's always a nice touch to put together a little packet for your students. It might be that you just want to get care or arrangement instructions on paper, or that you'd like to put together notes on the history of a particular form of flower arranging, specific types of flowers or options for students interested in further study. Again, instructions can be done in bullet points or numbered lists. Longer notes should be broken up into short paragraphs, and a new page used for new topics (Japanese flower arranging on one page, Chinese flower arranging on another). A small folder emblazoned with your business information (via a business card pasted to the front or the information printed or written in yourself) is just the thing to hold these notes. And don't forget to keep copies yourself. After a few such gatherings you may begin to think about turning these pages into extra text for your website, articles for a bit of freelance writing or even a book proposal. Writing website text can be tricky. For your homepage you want snappy writing that really sells your business and your flowers. It can be hard to hit the right style and tone bang-on the first time, so browse around other business sites, both floral and other types of retail, to see how others introduce themselves. Then you'll want a contact page with information on how others can find you (address and directions to shop, mailing address, telephone and email), and possibly an "about us" page detailing your own professional history and/or the history of your business. These pages should be brief and clear. After that, extra pages are up to you. Some florists like a few pages detailing care instructions or other information about flower arranging. Adding pictures to instructions can be very helpful as well. If you have them already written, your care instruction pages and workshop literature can be easily repeated on your website. Just don't post all of your website literature, after all students do pay extra for more information in your courses! Florists are in the unique position being trained in a craft that a large number of people would like to know more about. Not only are there trade (professional floristry) publications that might accept freelance articles, but women's magazines, newspapers, other lifestyle publications and websites might all run stories about flowers, gardening or flower arranging as well. When you find a market you like, ask if they have writers guidelines or look for them online and then follow them for your submission. For more information on how to approach publications have a look at the Writers' & Artists' Yearbook or any number of freelance writing guides. Perhaps the biggest writing project a florist can take on is to put together a nonfiction book on floristry, gardening or flower arranging, and the accompanying proposal. Book proposals can be sent to agents or publishers and generally include a proposal/introductory letter, a table of contents for the book, the first three chapters of the book, a marketing plan and possibly a list of competing books. Proposals should be written with the same tone and style as the book. Each agent and publisher will have different guidelines for what and how to submit, so follow them to the letter. Websites and the Writers' & Artists' Yearbook can again be a great help for this. Writing about flower arranging will become pertinent at some point in a florist's career. 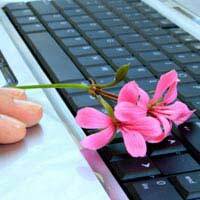 Writing care instruction, workshop literature, website text, freelance writing and book proposals are all possibilities for modern florists.